When and where Nazem Kadri was born? Nazem Samir Kadri (born October 6, 1990) is a Canadian professional ice hockey player. He currently plays centre for the Toronto Maple Leafs of the National Hockey League (NHL). He was drafted by the Maple Leafs seventh overall in the 2009 NHL Entry Draft. He played his junior career in the Ontario Hockey League (OHL), first with the Kitchener Rangers and then the London Knights. He won the J. Ross Robertson Cup with Kitchener and was part of the Rangers team that lost to the Spokane Chiefs in the final of the 2008 Memorial Cup. Kadri has also represented Canada internationally at the 2010 World Junior Championships, where the team received the silver medal after losing the final to the USA by a score of 6-5. Since the 2012–13 season, Kadri has led the league in number of penalties with 164, 46 more than the second place player, Dustin Brown of the Los Angeles Kings. Kadri grew up playing minor hockey for the London Jr. Knights of the MHAO's AAA Pavilion League. He was a key member of MHAO championship teams at the Peewee, Bantam and Minor Midget levels before moving onto the Ontario Hockey League (OHL) in 2006–07. He participated in the 2003 All-Ontario Peewee Championships in Markham, Ontario, as well as the 2005 All-Ontario Bantam Championships in Thunder Bay. 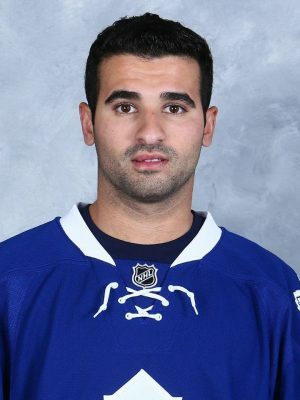 How tall and how much weigh Nazem Kadri?